Drivers who use the Courtney Campbell Causeway can expect to see major changes starting next year: a big hole, cut through part of the eastern section. FDOT says stormwater runoff is getting trapped in the north part of the bay and the pollutants are unable to flush, preventing the natural treatment process from occurring. Over the years this has had a dramatic impact on the health of the Bay. 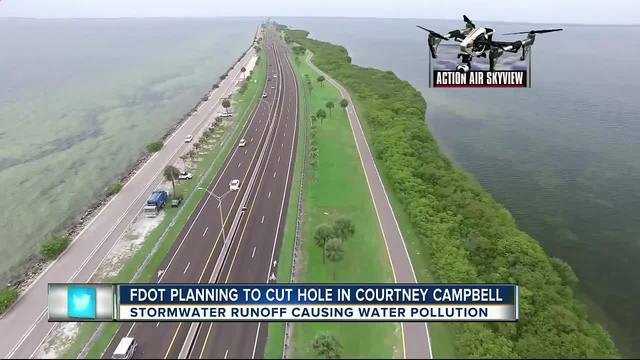 FDOT got a recommendation to essentially cut a "hole" in the eastern part of the Courtney Campbell Causeway to provide more circulation and restore tidal flows. However, transportation leaders say drivers and trail users will still be able to use State Route 60 and the CCC trail during the construction over the new "hole" in the causeway. They're constructing a 200-foot flat bridge, which will allow cars to pass over seamlessly. The cost of the project is $13.5 million. Some wonder if these changes will be able to make an impact. "I'm just wondering, is that really going to make a difference by changing it and putting it here?" asked Erica Hayward, a Winter Haven resident who regularly drives along the causeway. However, environmentalists say this will provide environmental benefits for years to come, especially when it comes to improvement in water quality, circulation and generating seagrass growth in areas. The removal of the section of the Courtney Campbell Causeway and bridge construction project is being completed in 2018.